Students will start this project with a clear piece of glass and finish with a stunning piece of art. Start by choosing your color palette, then pour the paint on fusible glass. Learn to create your own pattern using various techniques. 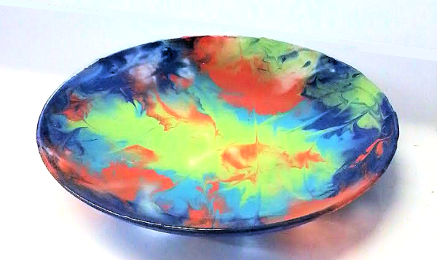 When fired, the vibrant colors seem to pop off the glass, or choose to fire them to a muted tone for a luxurious finished luster. This class includes instruction, all materials, and firings. 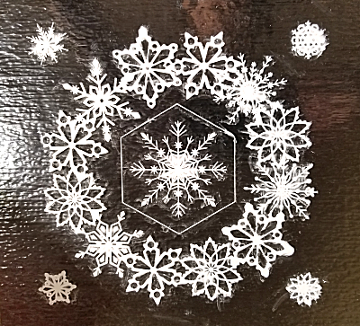 Students will explore the many ways of using fusible glass paints including the technique of Silk Screening your glass. By testing different types of paint with a variety of brushes, the student will discover how the paints react with the glass. 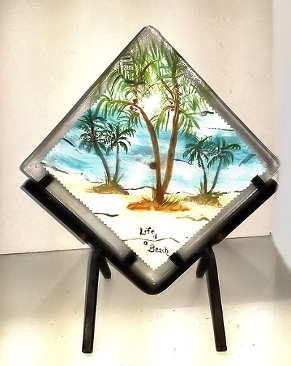 After testing the paint you will build a glass painted project combining up to three layers of glass using the painting techniques you have learned previously. This is a two day class, 3 hours first day, 2 hours second day, with all supplies included. On the first day the student will pick the glass of their choice, opaque white or transparent clear, determine which large flower shape they would like to make, learn to cut and layout their flower for design and firing in the kiln. We will then discuss the difference in paints, how to mix to the proper consistency then applying the paint to their projects. 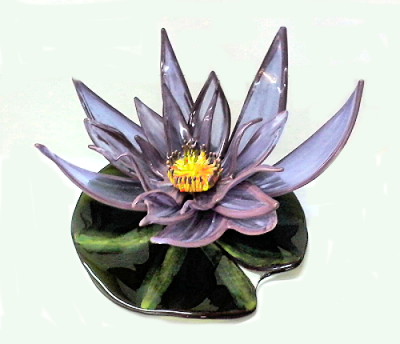 The Water Lily pictured was painted on clear class with opaque paint for the pad and transparent paint on the petals. When returning to the class on day 2 students will learn how to assemble the glass using a simple wire wrapping technique, securing the flower in place. 3-4 hours each day. 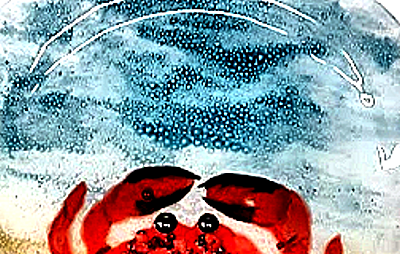 Students will learn to use CFE enamel glass paints creating their own designs adding bubble paint to create texture. Those who are experienced glassers can also cut their own shapes for unique pieces. Beginner and experienced fusers are welcome. Class includes instruction, glass, and firing. In this 3 hour class learn to use CFE Color Concentrates, translucent pigment in a gel base. 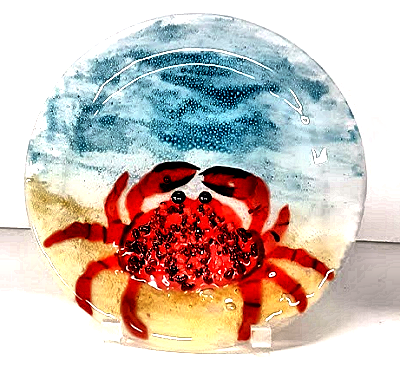 Paint designs on the papyrus fiber paper and the glass surrounding it, then fire in the kiln to give your finished glass a beautifully, unusual effect.